MIAMI (AP) When Bryce Harper struck out in the first inning, he stomped back to the dugout and took three swings at the bat rack , shattering his bat and producing a trio of angry thuds that reverberated in the stands. 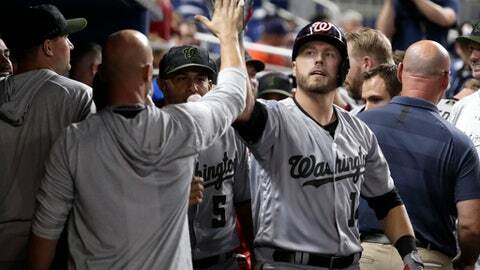 The Washington Nationals‘ mood didn’t improve much until the eighth, when Wilmer Difo hit a game-tying homer off the foul pole, and they rallied to beat the Miami Marlins for the 10th consecutive time Saturday, 4-1. ”That was quick,” he said with a laugh. The outing was his first in the big leagues since 2016.